I know most of my friends began planting their seedlings a month ago, and I started a few tomato plants. Now that we’ve got chickens (affectionately referred to as yard birds in our family), we’ve got eggs coming out our ears. I absolutely love it! I’ve been finding more and more ways to use up eggs in my daily cooking, even pulling out some old comfort classics. I’ve made the sons’ favorite quiches: cheddar bacon ranch & my Greek quiche. And the Hubs religiously makes 20 eggs worth of scrambled eggs every Saturday & Sunday morning. Luckily, I discovered another great use for some of my eggs AND a way to free up space in my garden. I’ve started growing basil from seeds in egg shells in my kitchen bay window sill. It’s a genius idea, and apparently not even a new one. It’s been a tried & true method for ages. Plus the egg shells are compost-able adding extra nutrients when the established plants (still in the shell) are potted. To find out more about how to do it yourself, check out this helpful article. I couldn’t have stumbled onto the idea at a better time though. Now that the major frosts are over, we’re expecting our local store to get their plants in soon. We’ve already got everything tilled, with our years worth of compost mixed in. In my eagerness, I’ve been trying to map out exactly where I’m going to put what- and I keep running into the same problem. No matter how I work it, how I rearrange it, there’s just not enough room for all my herbs. I plant a lot of herbs each year, or at least try to, but was planning on significantly more this year. Not only do I love cooking with fresh herbs all Spring & Summer, we dry them out and have them to use all year around. Nothing’s wrong with the store bought variety. Still the much stronger flavors are too obvious to ignore. So now in addition to my basil that’ll be going into the garden, I’ve got seedlings sprouting in the house that eventually be transferred to and grow in pots. Give me all the basil! I need them, the leaves I mean. 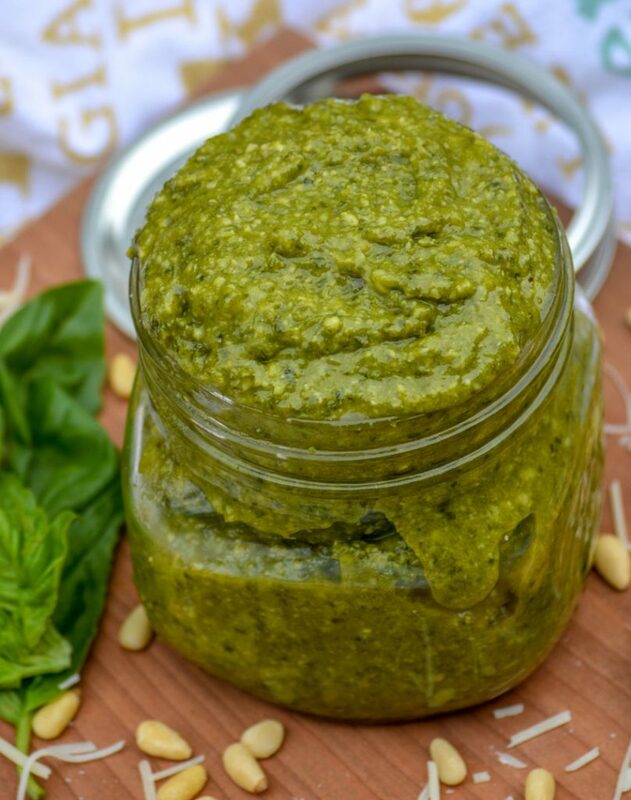 I need lots of them in order to make my family’s favorite sauce, Nonna’s Homemade Basil Pesto. Like with the egg shell hack I mentioned earlier, pesto’s another thing that’s been around for ages- although not always in the same shape/form. This recipe is for a traditional pesto Genovese. The name ‘pesto’ comes from the Italian word verb for to pound or to crush. Which is exactly how this dish was made, with a mortar and pestle, for centuries. Luckily, modern technology invented the food processor and made things much simpler. While the Roman’s had there own spin on things, my husband’s Nonna’s version has more modern roots. In the middle ages, Italian’s in Genoa had a rustic version featuring a mash of garlic and walnuts- both staples of a seafaring population. During the 1800’s trade brought about the introduction of of Basil (which obviously took off in a huge way) & European pine nuts. These were both added to the mashed dish and pesto Genovese was born. It naturally became a hit in it’s native region of Italy, and like any other thing in Italian cuisine- many family’s put their own unique spin on it. Kinda like with the other sauce, the tomato based version- which is why recipes may often differ. 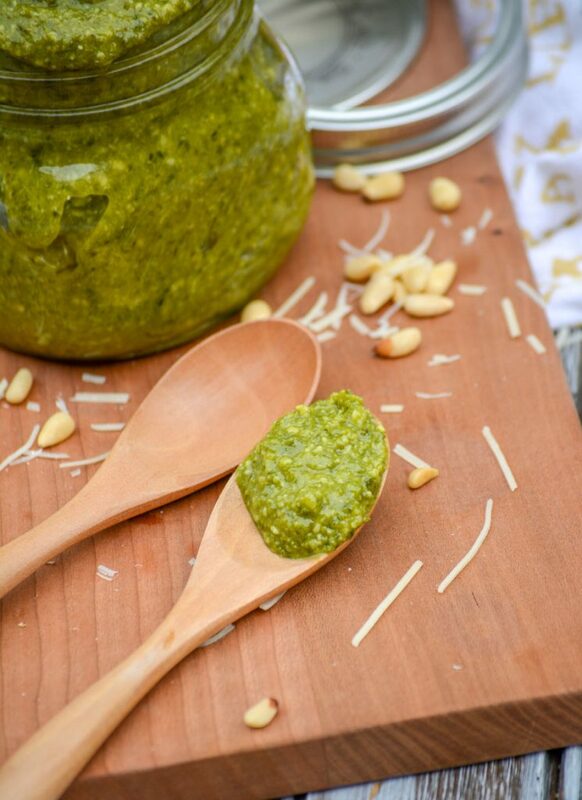 We’ve kept it simple and classic though with our Nonna’s homemade basil pesto. My husband’s the son of second generation immigrants from Italy, and he grew up familiar with pesto sauce. I’m pretty sure it was even one of his first foods too, covering finger sized pasta. So for him, it’s always been a way of life. I never heard of the stuff growing up. A fun fact I learned? 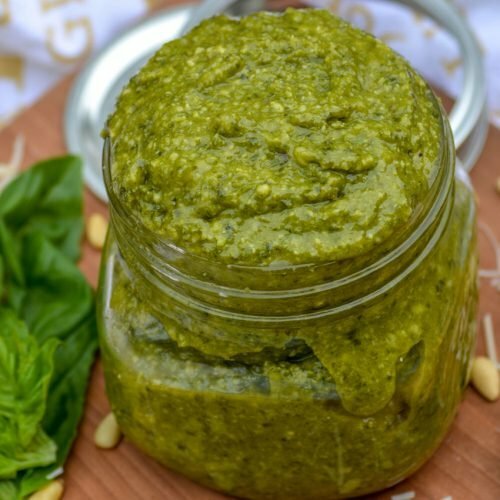 Pesto may have been incredibly popular in Genoa, and quickly catching in other regions of Italy for a long, long time- but it didn’t really take a foothold here in the states until the late 80’s, early 90’s. 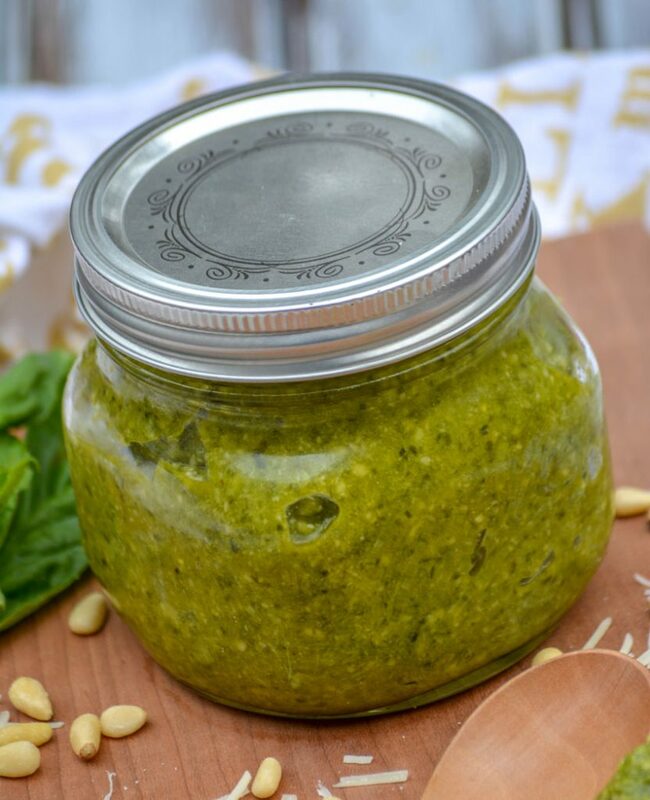 Keep it simple, and kick it old school with a fresh batch of homemade pesto. Don’t be scared either, I’m not kidding when I tell you it’s easy. Six simple ingredients are all you need: garlic, salt, olive oil, fresh basil leaves, lightly toasted pine nuts, and Parmesan cheese. Everything is added to the bowl of a food processor fitted with the sharp blade attachment in stages, and then blended until the sauce comes together. The sauce is good and ready to use as soon as it’s blended, but I like to refrigerate mine first since it tends to thicken up a bit. This recipe makes roughly 1 & 1/4 cups worth of pesto. It’s the perfect amount to generously cover a pound of pasta. If you need more, it easily doubles. Often times I make an extra big batch, and freeze the extra for quick use at a later date. 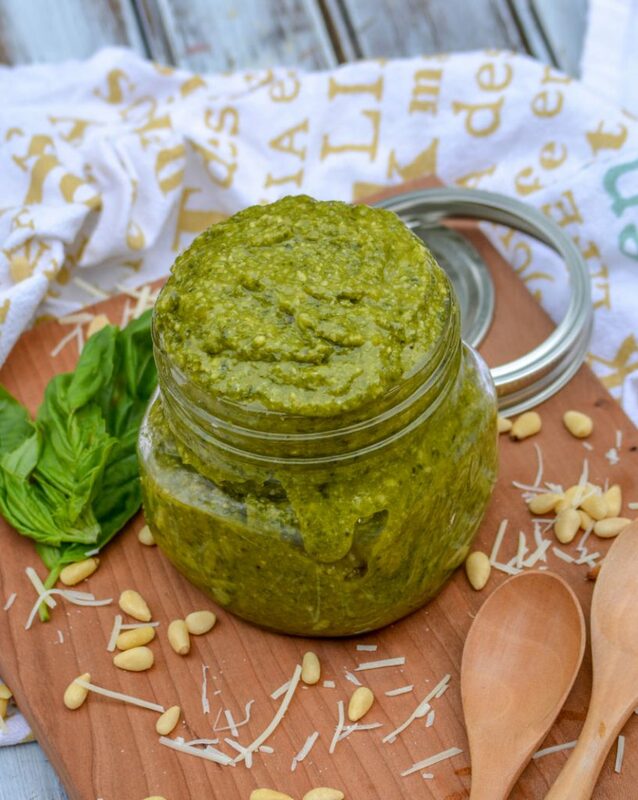 Nonna’s homemade basil pesto is also easily adaptable. Don’t have Parmesan cheese? No worries, you can sub pecorino romano instead- my husband’s Italian cousins taught me that little trick. Don’t have basil out in the garden, or it’s out of season? They also swear by subbing other herbs such as parsley or arugala, even mint. Pine nuts can be pretty pricey but walnuts, almonds, and even pecans all make more affordable substitutes. 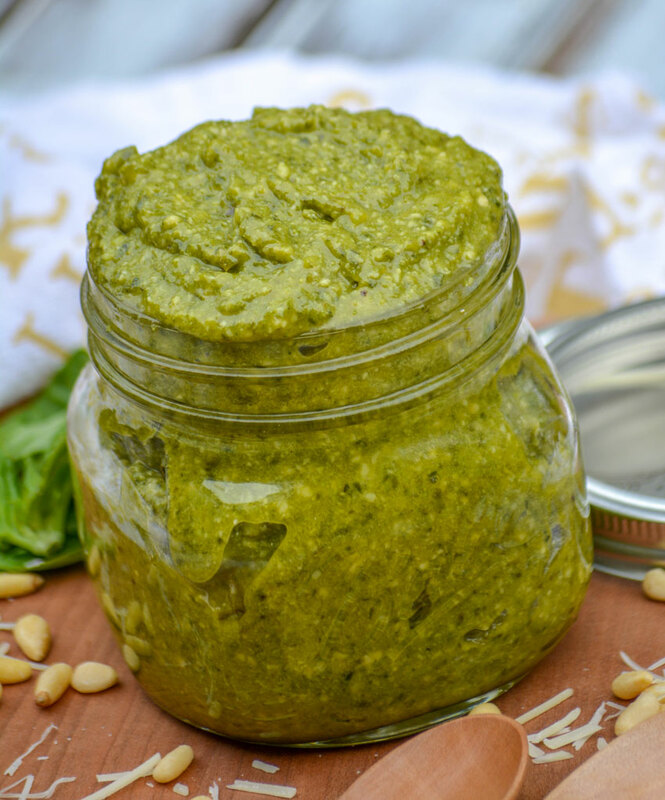 Whatever your individual preferences, cross the jarred pesto off your grocery list and go homemade instead. All the best things have been done before, and it’s high time we rediscover them and take a couple pages out of the old family books. And if it’s an option, make sure to plan an extra row of basil because once you taste this green sauce, you won’t be able to live with out it! 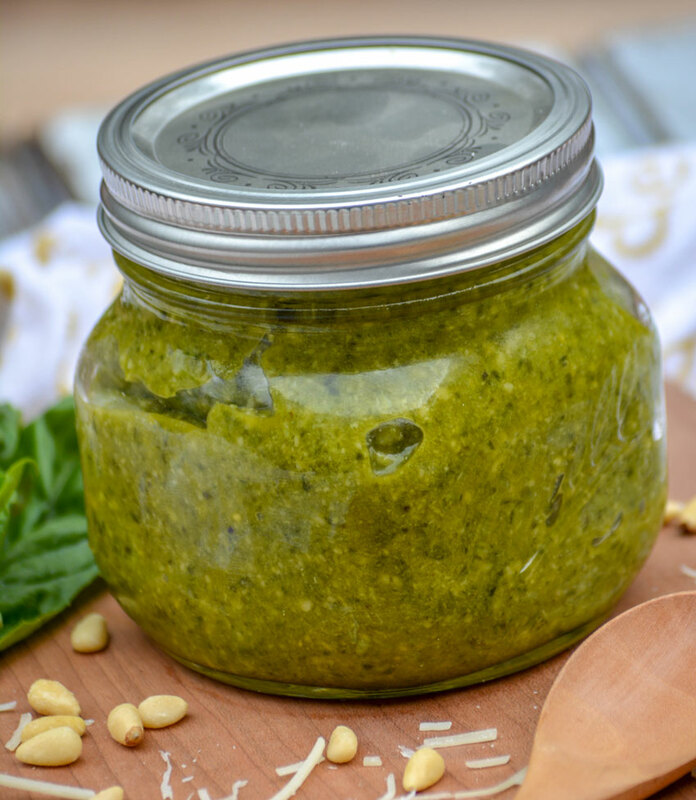 A simple, six ingredient family recipe for classic pesto Genovese- this basil laden version comes straight from our Italian Nonna's kitchen! Fit the bowl of your food processor with the sharp metal blade attachment. Place all the basil leaves at the bottom. Secure the top. Hit the on switch, and as soon as the blade starts drop in the garlic cloves. When the basil and garlic are all finely chopped, stop it & pour in the oil. Turn it back on and drop the nuts in. Once the nuts are finely ground, add in the cheese. Process until well blended. Stop the machine, scraping down the sides as needed, to make sure everything is evenly blended. Use immediately, or jar and store in the refrigerator until ready to use. Love pesto and I do make my own. I freeze in ice cube trays because there is only me and do not need lots. If I double this I freeze the extra too. It freezes so well, and it’s a great way to use up my fresh basil and have it keep so I can enjoy even when the growing season’s over. Your pesto looks so good, so inviting! It is just the perfect amount of thick and runny. 🙂 Love the recipe. I love pesto! I lost my basil almost overnight to a fungus last year so it will go in a new spot and fingers crossed! !